Sharing a stage with Myanmar’s leader Aung San Suu Kyi in the capital Naypyidaw, he did not address the Rohingya crisis head-on but instead tip-toed around the unfolding humanitarian emergency. Peace can only be achieved through “justice and a respect for human rights”, he said in a broadly-framed speech that also called for “respect for each ethnic group and its identity”. The word “Rohingya”, an incendiary term in a mainly Buddhist country where the Muslim minority are denied citizenship and branded illegal “Bengali” immigrants, was entirely absent from his speech. 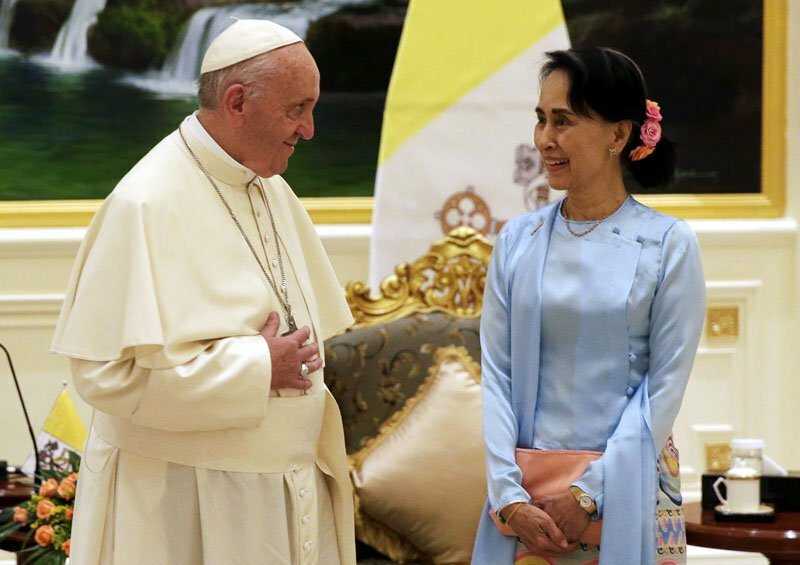 Francis has repeatedly defended the group, some 620,000 of whom have fled from Myanmar’s Rakhine state to Bangladesh since August. The pope’s peace mission is studded with pitfalls in Myanmar, where a monk-led Buddhist nationalist movement has fostered widespread loathing for the Rohingya. But the pontiff’s words were of little comfort to Rohingya stuck in dire conditions in Bangladesh. “We are very much disappointed that he did not mention the Rohingya crisis,” said Rohingya activist Mohammad Zubair from Kutupalong refugee camp, speaking of a religious leader who previously “even held prayers for the Rohingya”.